The fastest lap set during the Le Mans Series event at Spa in May was the Pescarolo’s best race lap of 2:06.687. Jan Lammers was testing his Dome there last week, and he lapped faster than that. “We set an unofficial (sportscar) lap record, with a time of 2’05.68,” says the Dutchman. Lammers covered 1400 km during the two days. The test got in the way of a plan to race the Howard-Boss Crawford at Utah – but Andy Wallace and Butch Leitzinger seemed quite capable of coping without their Dutch mate. Jan Lammers expects to be helping out Howard-Boss Motorsports at some of the longer Rolex Series races next year – and he’s also racing in the Grand Prix Masters (next race in South Africa in November). PS. 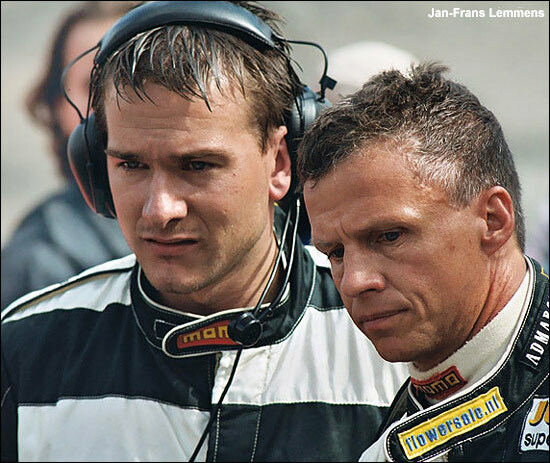 We think the last time Jan Lammers raced a Dome at Spa was in the FIA SCC / British GT 1000 km event in 2003 - where this photograph was taken (Jan with his technical man Davy Lemmens).